“You have said so,” Jesus replied. “But I say to all of you: From now on you will see the Son of Man sitting at the right hand of the Mighty One and coming on the clouds of heaven.” (Matthew 26.64)This week I want to talk a little about a phrase Jesus uses repeatedly in the Jesus stories of Matthew, Mark, Luke and John. This phrase is “Bar Enasha.” This is a Hebrew phrase that even Historical Criticists of the Jesus Story admit is original to Jesus. 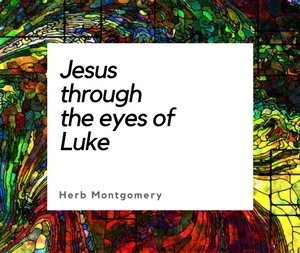 It is used more than 81 times in the four versions of the Jesus story that we have today. It is the only phrase Jesus used anywhere nearly as much as the phrase “the Kingdom.” Modern translations translate this Hebrew phrase (Bar Enasha) via its Greek version into the English phrase “Son of Man.” However, this is a transliteration from the Greek, which in turn was a transliteration of the Hebrew “Bar Enasha.” What did this phrase mean, not in the Greek, but in the Aramaic that Jesus spoke? This Hebrew phrase comes directly from Daniel 7.13. Pay close attention to verses 13 through 14 and verse 27. You will see clearly that Bar Enasha (what in English is translated as “Son of Man”) is much more than a mere individual, and is a new humanity that finds its source in that individual. “Son of” is merely a Semitic idiom meaning “Of or pertaining to the following genus or species.” Translating Bar Enasha as the “True Humanity” or “The Human Being” or the “Divinely revolutionized humanity,” or, as some historically have called it, “beloved community” would be better than merely “Son of Man.” Here is a side exercise. Go back and reread all the times Jesus uses this phrase “Son of Man” and try to see what Jesus is saying “communally.” In other words, look at this phrase, not as merely talking about Jesus himself as an isolated individual but rather as Jesus himself AND this new humanity he has come to give birth to. It’s not Jesus or the New Humanity, but Jesus AND His New Humanity. Notice, here Jesus is not talking about some event in the future on literal clouds. (Although Jesus will return on literal clouds.) Jesus here is quoting Daniel 7 and saying, “What Daniel is referring to in verse 13 taking place at that moment, “right now” before your very eyes! Jesus said, “from now on!” Jesus is quoting Daniel 7.13 and applying it to that very moment and from that very moment onward! Through Jesus’ death and resurrection, which was at that moment set in motion, He would be giving birth to this new humanity, the Bar Enasha. This is what Jesus had been referring to throughout His entire ministry as the coming of the Kingdom. We must make no mistake here. We, as followers of this Jesus, are not only invited to be a part of this new humanity birthed through Jesus’ death but are also called to put on display what this new humanity is all about. We are called to be the world changed by Jesus! We are not called to force, through legislation, change over the world around us. No, no! We, as the church, are called to BE this whole new world radically changed by Jesus Christ. To put on display what that looks like! We are called to put on display what this new humanity birthed out of Jesus’ death and resurrection is all about, NOW! 3.Be prepared to share with your HeartGroup not only what you just wrote down but also, according to the Sermon on the Mount, what you perceive this New Humanity, this Bar Enasha, to be about. Remember, it is Jesus’ first coming that gave birth to the coming of the Bar Enasha whose coming in turn gives birth to Jesus’ return, cause and effect. Remember, the Bar Enasha, Jesus’ Kingdom, is a radical new way of doing life. This new way of doing life is based on a radically new picture of the character of God, a radical change in how we view ourselves, as well as a radical change in how we see everyone else around us. Jesus gave us a way to heal our world. The only alternative, according to Jesus’ parables, is annihilation, but we are not there yet. There is still hope. Jesus would not have come had there not been. There is still work to do. This world is right where WE belong. This is our home, given back to use through the death and resurrection of Jesus. (See Revelation 21-22.) And we are called to put on display the coming of the Bar Enasha, the coming of this new humanity rooted in the person and the teachings of Jesus Christ. We are called to invite all who are willing to be a part of this revolution. In a phrase, we are called to “enlarge the Kingdom” that arrived with Jesus’ first coming, so that Jesus as King can return to shepherd this new humanity at his second. In the upcoming weeks, we will be looking at Jesus’ two alternative “end of the world” scenarios. This world is set on a collision course with death. But Jesus gave us a way out. Jesus, in Matthew, Mark, Luke and John, gave us a way to heal our world, if we will only listen. We’ll get to that subject in the upcoming weeks. Until then, keep living in love (Ephesians 5.1-2), keep loving like Jesus and keep enlarging the Kingdom! The Bar Enasha has come, and if you are willing, you are welcome and invited to be a part. I love you guys. Now go build the Kingdom. Long live the Bar Enasha!